Clara and I had lots of fun crafting up a few last-minute goodies for Easter, including this CUTE (and frugal) card using her fingerprints!! 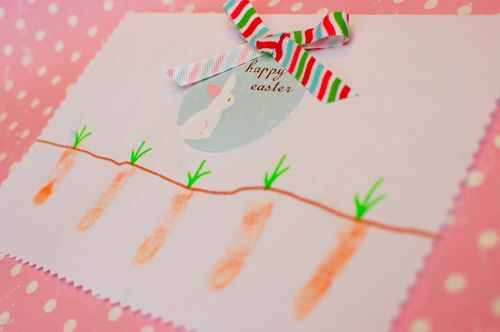 I drew a line to mark the soil with a brown marker, then Clara pressed about 1/2 of her index finger on an orange ink pad to make the carrots. She loved “planting” her carrots in the ground!! Later, I added the leaves with green marker and embellished the card with some leftover ribbon and such. Clara’s convinced that rabbit is going to eat all her carrots! Also?? A quick tip — washable ink comes off easily with baby wipes! Yay for low-mess crafts!! These carrots look seriously sweet. I am sure the recipient will be happy to receive such a special card! Very cute! Baby wipes are awesome for mess-free crafting! This is a super-cute idea! And there’s time to send some to the grandparents before the weekend yet! What a cute idea. Love the card! Love it! I think we might try this today after school. No orange ink pad, so paint will have to do. A great idea to give to the grandparents. I like that the carrots are still in the ground 🙂 Also, as usual, love the fabric your craft is sitting on. Very cute. I love the finger carrots! We just made some Easter cards last week and used our thumb prints to make eggs and then decorated them with colored pencils. We will have to give the carrots a try next!